Doubleday, 1990. Hardcover. Good. Disclaimer:A copy that has been read, but remains in clean condition. All pages are intact, and the cover is intact. The spine may show signs of wear. Pages can include limited notes and highlighting, and the copy can include previous owner inscriptions. The dust jacket is missing. At ThriftBooks, our motto is: Read More, Spend Less. Doubleday, 1990. Hardcover. Acceptable. Disclaimer:A readable copy. All pages are intact, and the cover is intact. Pages can include considerable notes-in pen or highlighter-but the notes cannot obscure the text. The dust jacket is missing. At ThriftBooks, our motto is: Read More, Spend Less. Doubleday, 1990. Hardcover. Acceptable. Disclaimer:A readable copy. All pages are intact, and the cover is intact. Pages can include considerable notes-in pen or highlighter-but the notes cannot obscure the text. At ThriftBooks, our motto is: Read More, Spend Less.Dust jacket quality is not guaranteed. Book condition: Very good in good dust jacket. Dust jacket showing slight aging and wear..
New York, NY: Doubleday Books, 1990. First edition. Stated: "First Trade Edition, May 1990. Hard cover. Very good in good dust jacket. Dust jacket showing slight aging and wear... Sewn binding. Cloth over boards. 1200 p. Contains: Illustrations. Audience: General/trade. Doubleday, 1990. Hardcover. Good. Thick hardcover. Some thumbing wear, minor bumping, still okay overall. Jacket has rubbing, creasing & some chipping, still decent, but worn. Not price clipped. May not be available for international shipment due to weight/size. Doubleday. Hardcover. 0385199570 Crisp pages. Tight binding. Different cover than shown. Light shelf wear on dust jacket. . Very Good. New York: Doubleday, 1990. Hardcover. Thick 8vo. Shelfworn, loss to top corner; good+ in good+ rubbed dustjacket showing short closed tear to front cover. Doubleday. Very Good in Very Good dust jacket. 1990. Hardcover. 0385199570 . 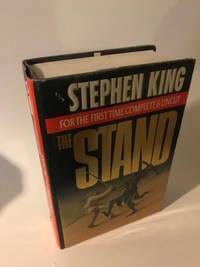 New edition, book club, of The Stand features a considerable amount of previously unpublished material which was originally cut from the first edition of the book. 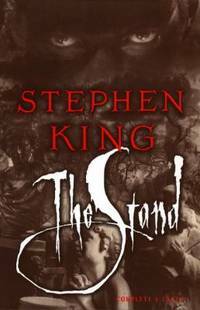 This issue of The Stand now comes much closer to the author's original intention. Large book in vg condition, free of former owner writing or bookplates, spine as usual is slightly concavee. Vg Jacket with minor wear to edges. Jacket will arrive in a fresh mylar cover. * (THIS BOOK IS IN OUR POSSESSION. WE SHIP MOST BOOKS SIX DAYS A WEEK AND WILL CONFIRM WITH TRACKING NUMBER FOR DOMESTIC ORDERS OR CUSTOMS NUMBER FOR NON DOMESTIC) *; 8vo; 1152 pages . Doubleday. Very Good in Very Good dust jacket. 1990. First Edition; First Printing. Hardcover. 0385199570 . First Printing of this new issue, states first trade edition. 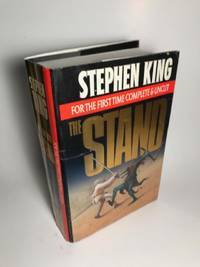 This new edition of The Stand features a considerable amount of previously unpublished material which was originally cut from the first edition of the book. 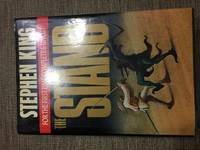 This issue of The Stand now comes much closer to the author's original intention. Large book in vg condition, free of former owner writing or bookplates, light shelf rub to book and some concavity to spine common on books of this heft. Vg non price clipped ($24. 95) Jacket with small wear to edges and some thin crinkles in the publisher issued laminate on DJ. Jacket will arrive in a fresh mylar cover. * (THIS BOOK IS IN OUR POSSESSION. WE SHIP MOST BOOKS SIX DAYS A WEEK AND WILL CONFIRM WITH TRACKING NUMBER FOR DOMESTIC ORDERS OR CUSTOMS NUMBER FOR NON DOMESTIC) *; 8vo; 1152 pages . Doubleday. Hardcover. 0385199570 HC/DJ in Very Good Condition. 2 4 6 8 9 7 5 3. Complete and Uncut 1990 version with original artwork. DJ has light wear - Has not been price clipped - $24.95. Binding is good, slight lean. No markings. Light soil to text block. . . Very Good. New York: Doubleday and Company, 1990. Illus. by Wrightson, Bernie. Very Good. Cloth. First Thus,First Printing. 8vo (up to 9½" tall). Some rubbing and wear to rear panel of jacket. .
New York, New York, U.S.A.: Doubleday, 1990. Hardcover. Near Fine/Near Fine. BOMC/Book Club Edition. No ownership or other markings. Tight binding, appears unread. Dust jacket is protected in mylar. A lovely copy that appears close to new. Ships within 24 hours! Doubleday. Hardcover. 0385199570 Please allow 4 - 14 business days for Standard shipping, within the US. Thank you for supporting our small, family-owned business! . Fair. 1990-05-01. 1st. Doubleday. Hardcover. 0385199570 *BRAND NEW* Ships Same Day or Next! . New. Doubleday. Hardcover. 0385199570 *LIKE NEW* Ships Same Day or Next! . Fine.